Life in Massena is as harsh and barren as the frigid landscape. In this bleak terrain, two hardened single mothers are trying to make lives for their children. Lila is a widowed Mohawk whose mother-in-law “stole” her newborn son a year ago. Ray is a mother of two whose gambling-addicted husband just left town with the down payment for their new trailer home. Faced with little opportunity to make ends meet, Ray and Lila embark on an illegal venture transporting immigrants into the U.S. across Mohawk territory. With the money for the down payment within Ray’s grasp, the women are determined to make one last run. When circumstances spiral out of control, the two women must make life or death decisions based on their friendship and love for their children. 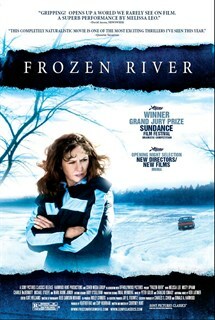 The winner of the Sundance Film Festival’s Grand Jury Prize, and nearly unanimous critical acclaim, Frozen River was nominated for two Academy Awards® including Best Actress, Melissa Leo.